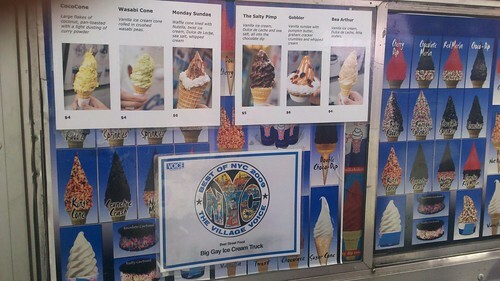 Last week, while it was a bajillion degrees out, I caught on my twitter feed that the Big Gay Ice Cream truck was going to be in the hood! I had to check it out before their store opened this past Saturday. Luckily the line wasn’t so bad (usually, there’s a ton of people). I decided to order The Salty Pimp. As you can see, this bad boy was made up of vanilla ice cream (I should add that this was VERY creamy…awesome), Dulce de Leche that was tubed right into the ice cream, along with sea salt and then dipped into chocolate dip. 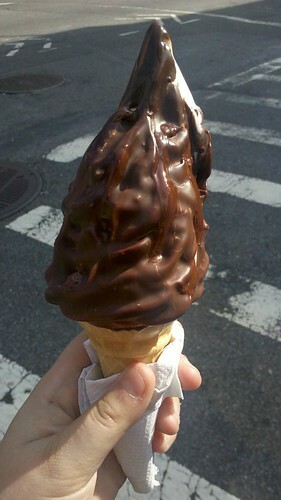 Definitely worth the extra calories on that very hot day. The one item I really want to try out at the store is their chocolate ice cream sandwich that has bacon marmalade on it! Another concoction of note is their vanilla cone that’s dipped in crushed wasabi peas. Sorry it’s been so quiet as of late. Posts on Austin and my pickling adventure are coming up next! I also found a great resource through work about eco-friendly ways to dye your hair. Hmmm. ~ by Rori on September 7, 2011.